Progression Ski Camps' founder Denise Jaworsky is at home healing up after an early season mishap in Whistler and she was able to take some time away from her already tremendously busy schedule to speak to Anna De Masi about her innagural Queen's Cup to take place in Park City, Utah on February 5, 2006. Thanks Denise!Queen’s Cup Open Park City Mountain Resort February 5, 2006 Some of you may know Anna De Masi from her work with Volume Video Magazine or because she’s super fun and has been spotted at pretty much every ski event of consequence. This season she’s adding her own event onto the schedule. 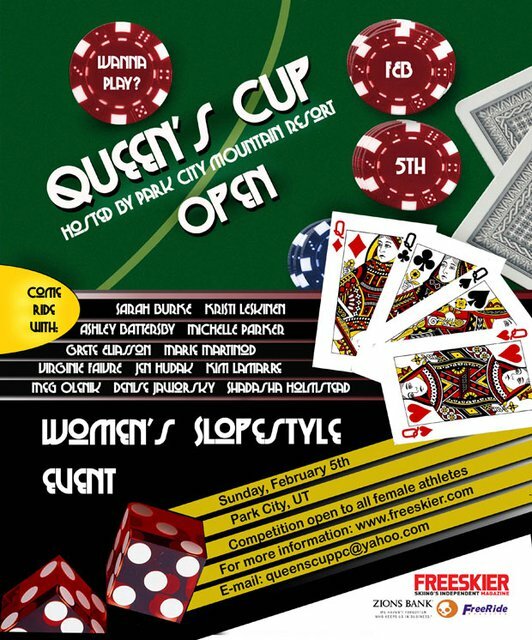 Anna has been working hard with Park City Mountain Resort to host the inaugural Queen’s Cup Open. This all-female slopestyle competition is much more than just a comp and Anna’s going to tell you all about it. DJ: Before we get started on the event, tell us a bit about you. Who's your favourite 90's rap artist? Anna: Hmm, I'd say maybe Run-DMC or Flava Flav. I used to rock the shell tops and it was all about the break beats. DJ: Where are you from and how did you get into freeskiing? Anna: I've lived in Park City for the past 7 years. My younger brother was a crazy skier and would always go build back country jumps and huck himself. It was entertaining and we all had some good laughs. I competed for a few years and that's how I got to know a lot of the people in the industry. I've had a lot of really good influences around me. DJ: How did you end up working for Volume Video Magazine? Anna: My brother always had volume vids around the house. I got into editing and filming a few years ago. I love electronics and toys, cameras and computers, It's addictive. I've known Steve Rozendaal for forever and I've always begged him for a job and he finally gave in one day. So, I did Volume 13 and 14. It was a great experience and I learned a lot. DJ: So, tell me about the Queen's Cup Open. What? Where? When? Who? Anna: The Queen's Cup Open is the first all women's slopestyle event. It'll be hosted by Park City Mountain Resort on February 5th, 2006. The event is open to all female athletes. It's basically going to be a laid back, fun event. We've invited all the top pro athletes in the industry. We have all the ladies attending – Sarah Burke, Kristi Leskinen, Grete Eliasson, Michelle Parker, Ashley Battersby, Marie Martinod, Virginie Faivre, Jen Hudak, Kim Lamarre, Meg Olenick, Shidasha Holmstead and many more. As well, we have a crew of the guest judges coming out to cheer the ladies on and present the prizes. We'll also have tons of giveaways, raffles, demos and more. DJ: Now why? What gave you this idea and what's motivating you to actually make it happen? Anna: I should give thanks to Marie Martinod, vodka and in flight entertainment. We were on our way back from a trip to Ottawa and just got into it. I mean, why not have an all women's competition? The girls have stepped it up to a level where they really deserve to be recognized for their efforts. I edited a few ski movies this past season and couldn't believe that I only had a couple shots of women skiers. I'm potentially interested in doing an all women's video and I want to get more women involved. Once I got started, there was no turning back! Everyone has wanted to make this happen from the beginning and I've had tons of support. The girls deserve it! DJ: Tell me about the course. We saw a ton of carnage in the women's slopestyle at the 2005 US Open. Is this course going to be tailored to the best female pros out there or are you going to make it something that more women will feel comfortable riding? Anna: Ya, last year's open got a little messy, but these girls are freaking tough! Our course will cater to everyone's ability level. The invited pro girls will assess the course and we'll make the proper adjustments necessary. We'll have some more difficult features, but they'll have the options of hitting some of the easier features. We have the pros out there to help coach the girls too. We want to give them the confidence to step it up and it's going to be a team effort. DJ: Team format? How's that going to work? Anna: The pros will pair up and then the ams that show up will be divided amongst the pros. Most likely, we'll have 4 or 5 to a team. We really want encourage camaraderie between the girls. It's a chance for the ams to get to know the pros in a positive environment with out really feeling the pressure of an intense competition. It's almost going to have a camp-like vibe where all the ams will really have a one on one opportunity to practice and learn from the best! They will compete against each other as teams in a jam format. Each team will take the course one at a time and they will be judged as a team. Everyone will have their individual strengths and it'll give them a chance to express themselves. DJ: Instead of teams, can we call them cliques? But really, what's more fun than watching Grete rip out Sarah's hair because she decided to be on Kristi's team instead of hers. How are you going to divide up the pros? Anna: Dividing the pros shouldn't be a problem. It's all about rock paper scissors. All the girls are pretty chill and everyone gets along, so I don't think there will be any catfights. The ams will be divided by ability level and potentially age. Depending on the age range of competitors we have sign up, we may do a junior division. We want the girls to be comfortable with who they're riding with and everyone has their strengths. It's a chance for these girls to learn from and cruise around with the top pros in the industry. DJ: You mentioned giveaways, raffles, demos and more. What is this ‘and more’ that you speak of? Anna: Tanner Hall will be doing the 'Oakley Thump II Trick of the Day' and will present one competitor with a pair of the new Oakley Thump IIs. Paul Mitchell will be doing 'extreme makeovers' for some of our guest judges (Rory Silva, Jon Olsson, Sean Fields, Craig Coker, John Symms). Rory needs it waaaay more than anyone else. In going with the poker theme, we're hoping to do a poker tournament after the event organized by Scott Hibbert. This event will be the premiere women's event in the world and it's going to go off! DJ: What about slumber parties and pillow fights? Is that on the agenda for after the poker tournament? If so, will Hibbert be organizing that as well? Anna: I'll let Hibbert organize it, but he has to wear attire that we select and we can take pictures of it. DJ: I’m sure Freeskier would be all over that. On that note…what kind of media coverage do you expect and how are you pitching this event to the media? Are you trying to sell it as a girl-powered sporting movement, a legit freeskiing event or both? Anna: I'm definitely selling it as both. The event is a legit ski event and would be considered the premiere women's event in the world, considering it's never really been done before. Of course this is going to play a big part in the women's movement in freeskiing as well and I hope for others to follow in our footsteps. The companies recognize this movement as an entirely new market with endless potential. So, everyone benefits from female oriented events and girl parties are fun. We get to add an element of creativity that is unique and represents us as the women of freeskiing. We have TV partners, magazines and radio stations on board for media coverage. Freeskier magazine and Park City Television along with their affiliates FuelTV, OLN, RSN. Freeride Magazine and Ski Time. We'll also have the major film production companies here so everyone can get shots for next years movies and potentially be featured in Freeskier's Women of Freeskiing Issue. DJ: What kind of response have you been getting from sponsors? Lately more and more women's specific twins are being marketed. Does this mean that companies are ready to invest in the ladies? Anna: Yes yes yes! Everyone I've talked to has been beyond enthusiastic. With all the new female oriented products coming out, it's a great opportunity for the companies to demo their new products and to pick up new female athletes to represent their new products. The companies will be scouting out new talent at the event and sponsorship contracts will be awarded to individual athletes. This is a great opportunity for our ams to get out there and get sponsored! DJ: So who are the sponsors? Anna: Our presenting sponsor is 4FRNT skis. 4FRNT saw this as a great opportunity to show their support of women in skiing. Their products and image are versatile and fit men and women and their style works well with the event. They're based out of Salt Lake and really like to be involved in the local ski community. They throw some pretty sweet parties too. I’d like to give a BIG shout out to Park City Mountain Resort for all of their support. Red Bull is a big contributor, as well as Paul Mitchell and Zion's Bank. Oakley is also making all of the swag for the event. The following companies are all contributing product prizes and sponsorship contracts, and even more product for raffles and giveaways: Skull Candy, Prudential Real Estate, Amstel Light, Spy, Scott, Salomon, K2, Line, Girl Powder, Predator, DaKine, Icer, Freestyle Watches, Teen Ink Magazine, Freeride Magazine, Freeskier Magazine DJ: Which companies will be out there looking for new talent? If I'm a girl and I can do a 360 and slide a box, should I come to this event to get spancered? That's the question that everyone is always asking. What is it that sets an athlete apart from the rest, making them worthy of representing a company's product? Anna: Everyone is on the look out for new talent, the field is wide open right now. The talent is there and the companies realize it, but they're also looking for girls that want to help the sport progress. They want girls that are going to step it up and be positive role models for all women in the ski community. If you can ski, you can come out to this event. Learn something from the pros and the pros get a chance to share what it takes to be one of the top skiers. It's a chance for the girls to get recognized for all their efforts, no matter what ability level they are. They'll also get a chance to meet the sponsors and talk to them about what's it's like to be a part of their team. DJ: I hear you designed the ad for the event by yourself. It looks fantastic! What aren't you doing by yourself? Do you have a co-pilot in this whole endeavour? Anna: Um, well, I've been flying solo on this mission for a while but I've had so much support along the way. Freeskier guys have been amazing and so helpful. Almost all the other reps I've talked to about the event have volunteered to come out and help in any way possible. The girls have all been great offering their ideas and suggestions to make this event truly something special and not some corporate affair. I'd also like to thank Oakley and Liesl for doing all of the t-shirts, hoodies, etc for the event. Amstel will be giving us some booze, so the party is on! I'd also like to thank Eric Iberg, who from the beginning saw the potential and has been a great mentor/advisor and I can't forget Ms. P and Steve Rozendaal for letting me raid all their address books. I have done all the ads, clothing designs and other graphics myself. I love the creative aspect of putting an event together! Though it's been a hectic learning process, it's been a great experience and I hope to do many more events in the future. Thanks again everyone! DJ: When can we see the designs for the t-shirts and hoodies? So many competitions have some pretty ugly shirts that you don't see many people wearing afterwards. Are you branching away from the stock competition t-shirt and going for something more wearable? Anna: Of course we'll have something a little more steezy then the usual. Oakley is hooking it up and we're working on a few designs. We're going to be getting a little creative with some of the other product prizes and have some great ideas for all the goodies. All the girls that enter will be getting free gear and I think everyone will be stoked. The event overall is something that's entirely different and we get to do what we want to. I'm always open to suggestions and ideas for this event and other projects. Feel free to send any design ideas to queenscuppc@yahoo.com and maybe your design could be used for one of our t-shirts. Remember the theme, poker tournament and let the games begin! DJ: So, where are you going with all of this? What about snowboarders? Do you think that in the future this could evolve into a multi-sport women's extreme sporting event or do you think it'll stick to just skiing? Anna: Of course it could evolve to something more. I'm friends with a lot of chick boarders and they're stoked! They're all about seeing women progress in all sports. There's just an understanding between all us ladies that we have to fight a little harder to get what we want. This event has endless potential and we're at a point where people are more open to new ideas and change. DJ: I have one final question. Are there going to be male strippers? Anna: It might be a little chilly up on the mountain for them, but we could most likely work something out for the after party. That's what's great about this event! The ladies can do whatever the ladies would like to do! I'll check the budget and we'll see if something can be worked out.